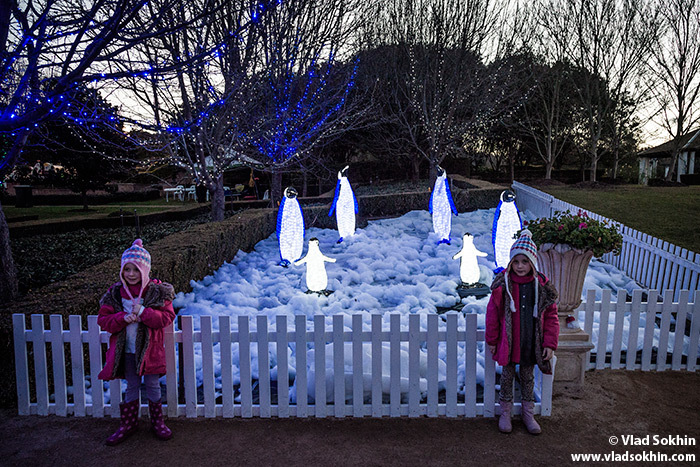 Two sisters stand near penguins statues at the entrance to the snow area in Hunter Valley Gardens. Every year from June to August in many places of Australia people organize winter-style festivities. In Hunter Valley Gardens, New South Wales, from 30 of June to 15 of July there are Snow Time activities that include snow ball battles, snow tubing and much more. Hundreds of people visit the Gardens and enjoy artificial snow, which is every day produced by snowmaking machines.